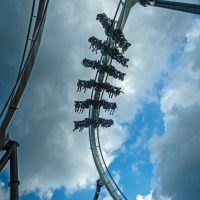 Swarm at Thorpe Park in the UK. 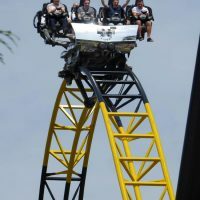 On a Wing Coaster, riders sit beside the track on “winged” seats, opposed to under or above the track like on regular coasters. 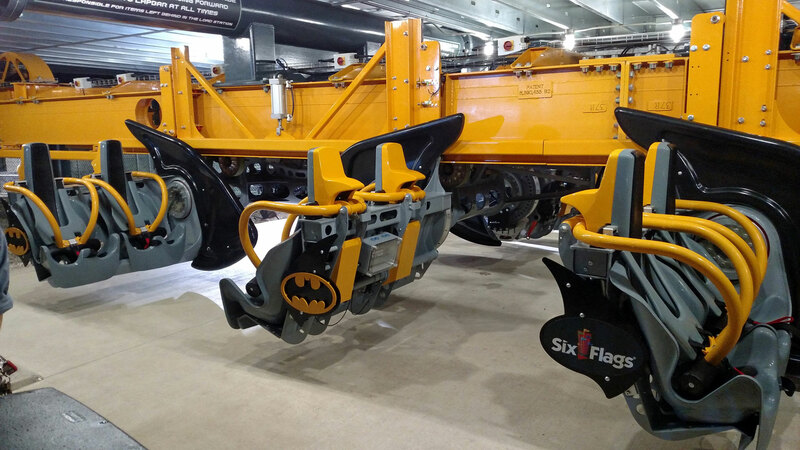 It’s a bit like sitting on the wings of a bird. 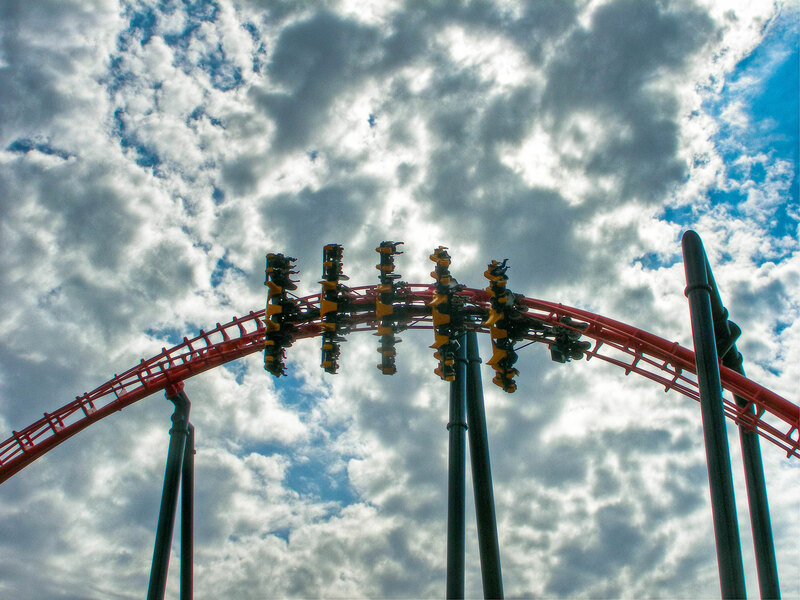 This means there is nothing above or below the rider, exposing the rider to the scenery and surrounding theme. 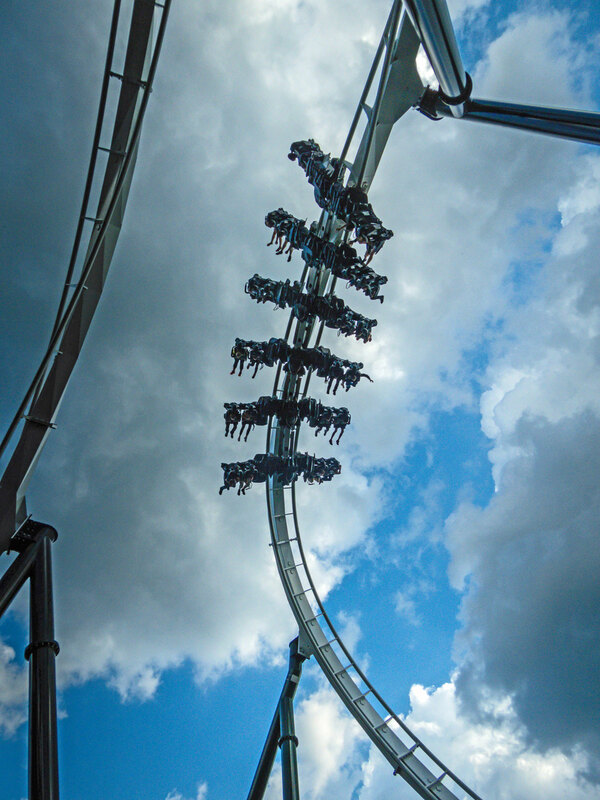 As the train travels through inversions, the rotation circle is wider for those on the outer seat, offering a different experience to that of the inner seats. 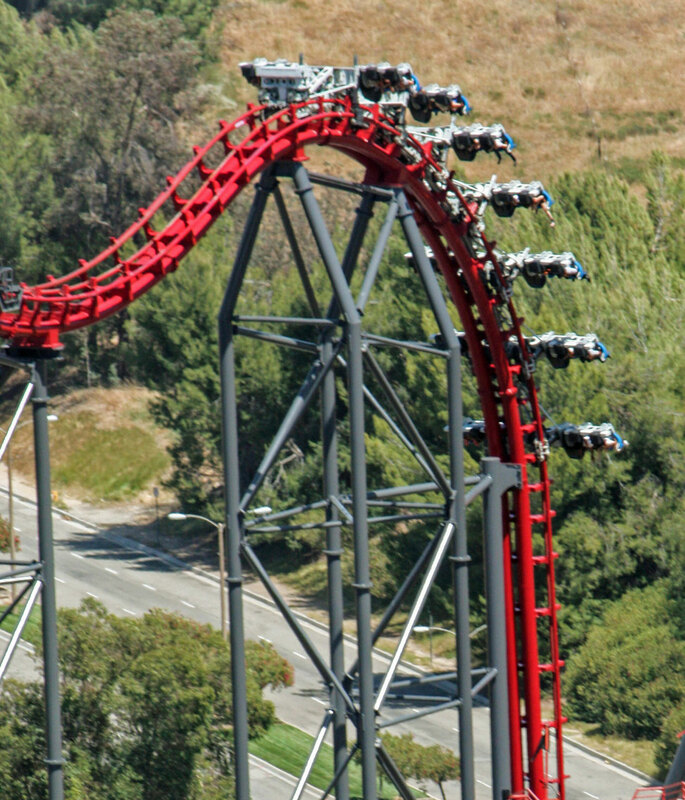 X2 at Six Flags Magic Mountain in California, USA. 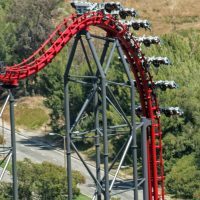 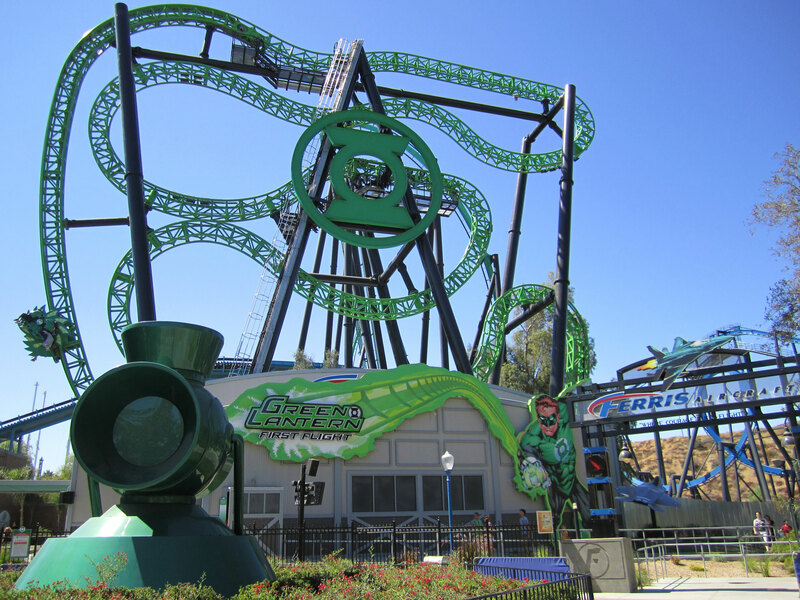 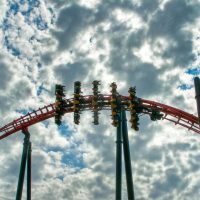 Although X at Six Flags Magic Mountain in California, USA, (or X2 as it’s now called) is technically classified as a Fourth Dimension (4D) Coaster, when it opened in 2002 it was the first coaster to use winged seats. 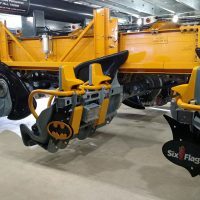 On this coaster, the seats rotate 360° as the train travels along the track so passengers could be riding head first at one point and then on their back the next! 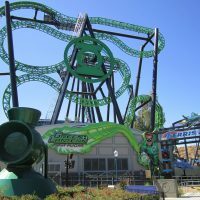 X was created by now defunct coaster designer Arrow Dynamics. 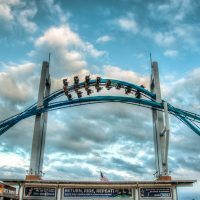 Only one of these coasters was made. 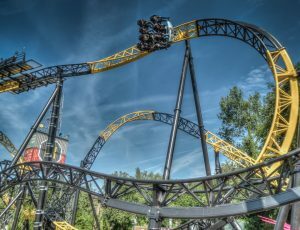 The ride is now maintained by S&S Worldwide. 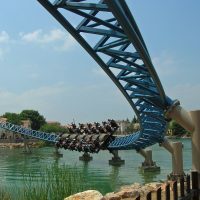 Intamin‘s Furius Baco opened in 2007 at PortAventura, Spain, and is generally considered to be the first Wing Coaster. 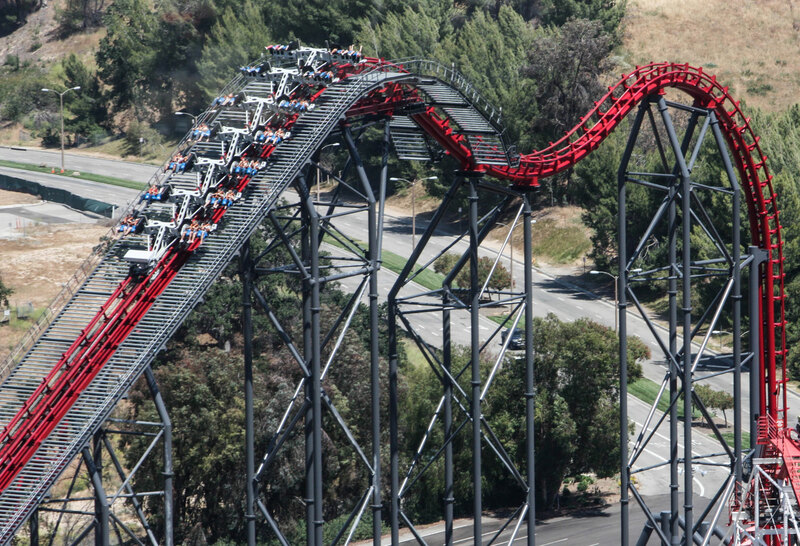 On this ride, riders are launched and travel through a canyon where the walls are really close to the riders. 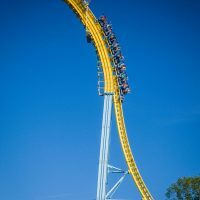 Unfortunately the design of these trains and the intensity of the launch and speed makes the ride experience uncomfortable; it’s particularly rougher in the outer seats than the inner ones. 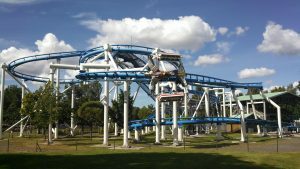 Furius Baco is the only original Intamin Wing Coaster to built to date. 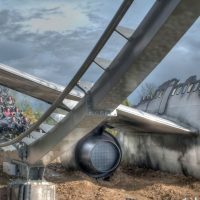 Intamin changed its winged-seating concept by putting the two centre seats above the track and positioning its outer seats a little lower on either side. 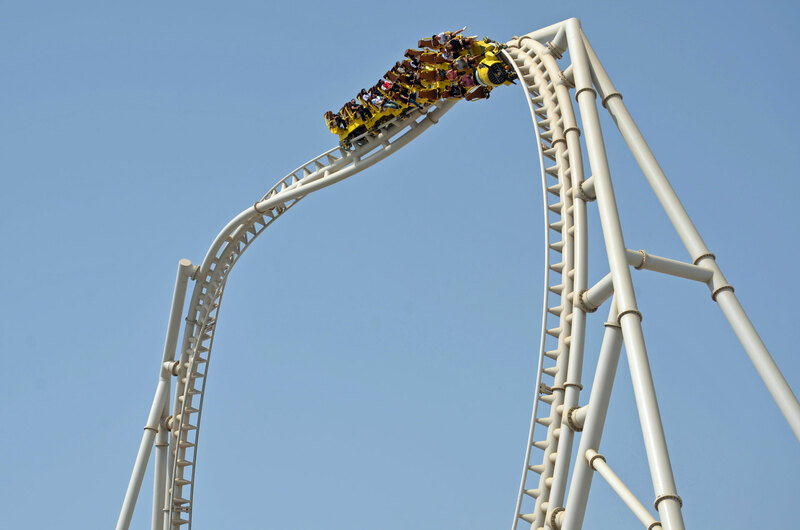 In this formation the riders on the outer edges have a more intense experience than those seated in the middle. 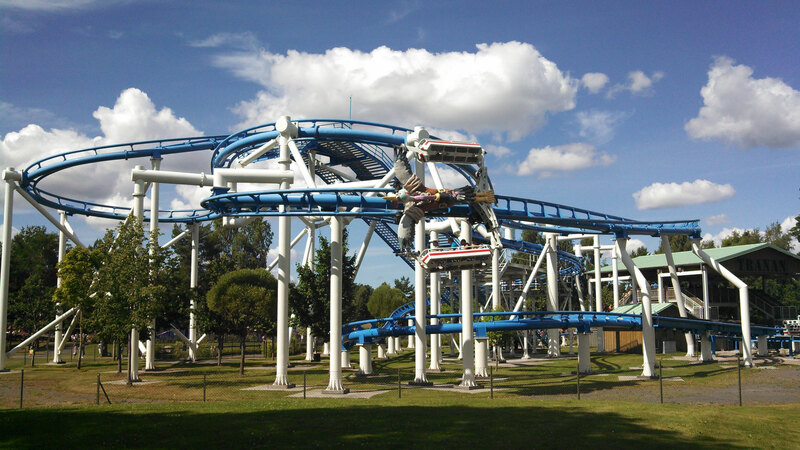 This Wing Coaster uses lap bar restraints instead of over-the-shoulder restraints like on other versions by other manufacturers. 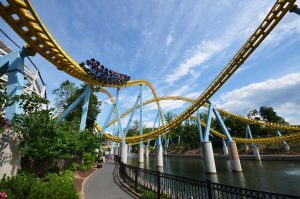 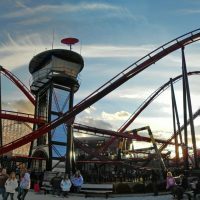 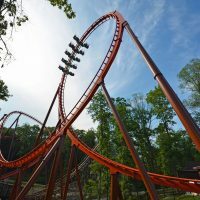 The company’s first new Wing Coaster to open was Skyrush at Hersheypark in 2012, followed in 2016 by Flying Aces at Ferrari World Abu Dhabi in the U.A.E. 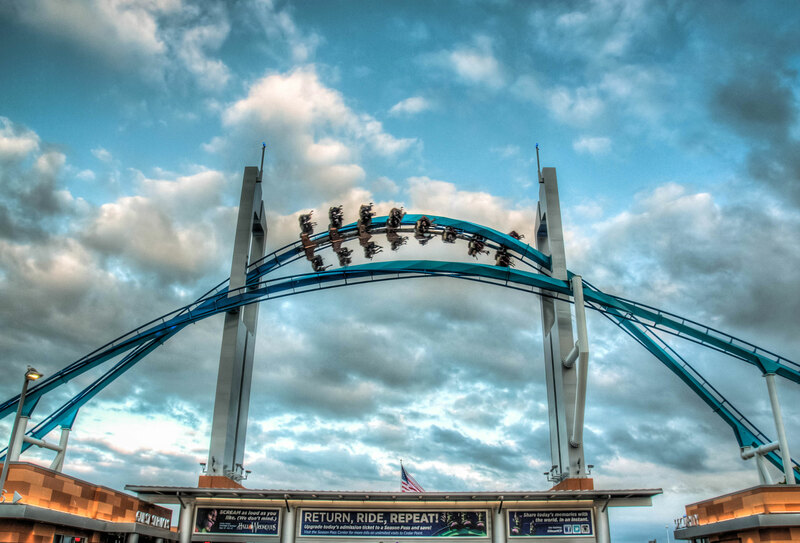 Gatekeeper at Cedar Point in Ohio, USA. 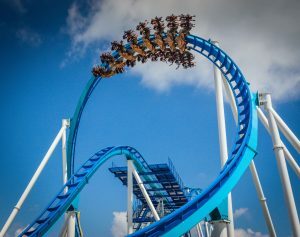 B&M‘s take on the Wing Coaster is the most popular of all the Wing Coaster models. 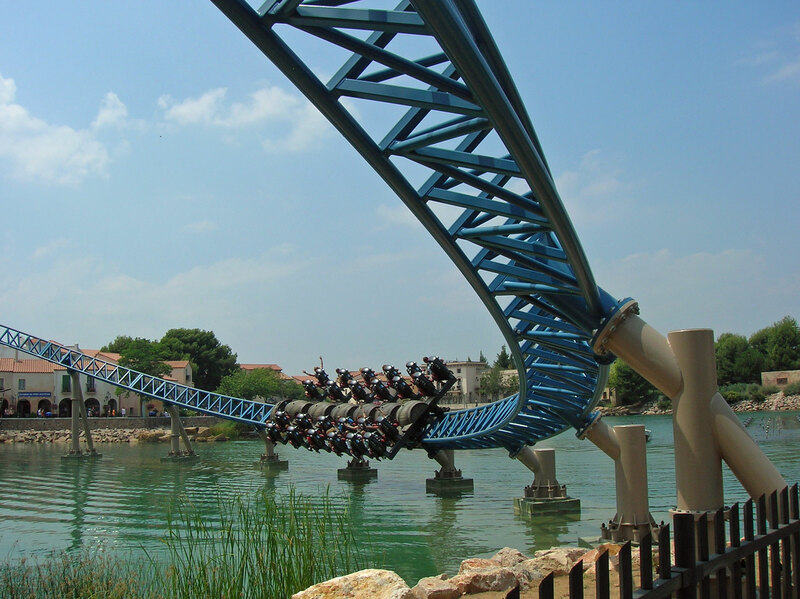 B&M perfected the train design and when the first of its kind opened in 2011 (Raptor at Gardaland in Italy), the smooth ride experience coupled with its impressive interaction with the surroundings proved to be a hit. 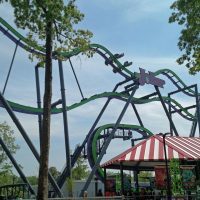 Some enthusiasts consider B&M Wing Riders to lack intensity compared to other manufacturers’ versions, but generally find the whole experience more to be enjoyable. There are nearly a dozen B&M Wing Coasters in existence, including a launched version – Thunderbird at Holiday World in Indiana, USA. 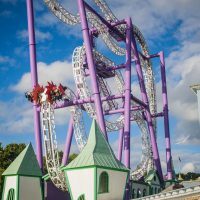 Insane at Gröna Lund in Sweden. Although technically a 4D Coaster, a ZacSpin coaster also features winged seating. 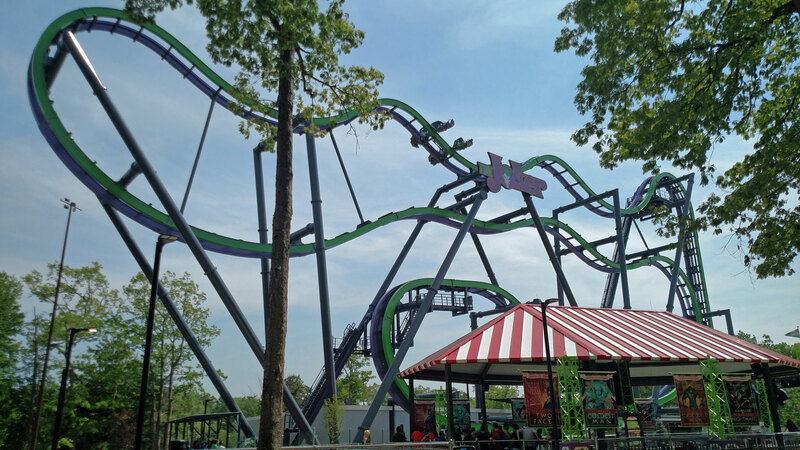 Up to eight riders sit on trains where four sit on one side of the track, four the other. 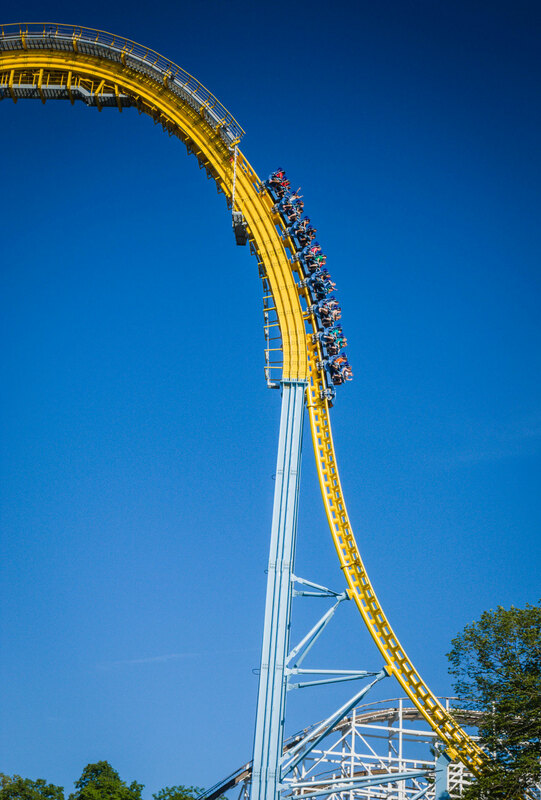 Riders are seated back-to-back on each side. 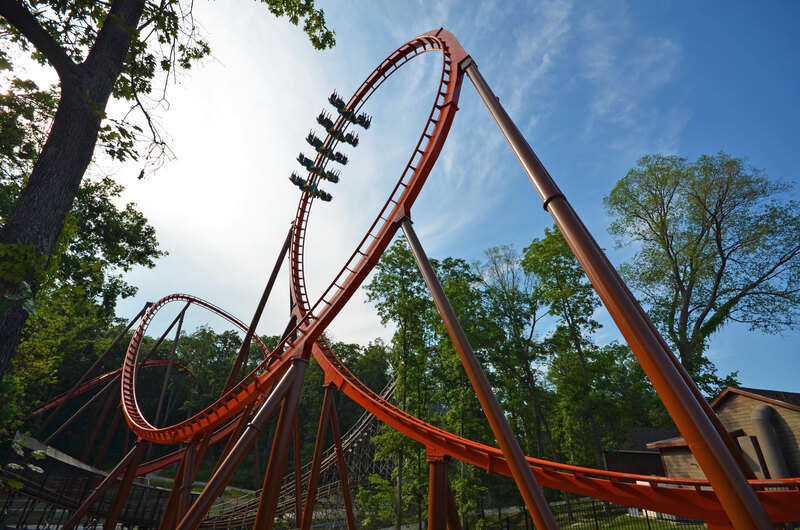 The train heads up a vertical lift hill where it then completes a snake like layout under each horizontal hairpin section of track. 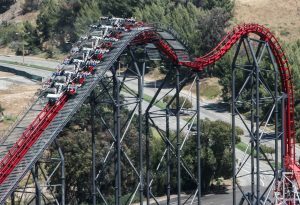 As the train moves along the track, it spins naturally using its weight and motion. 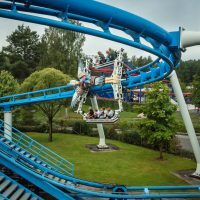 The first ZacSpin, Kirnu at Linnanmäki in Finland, opened in 2007. 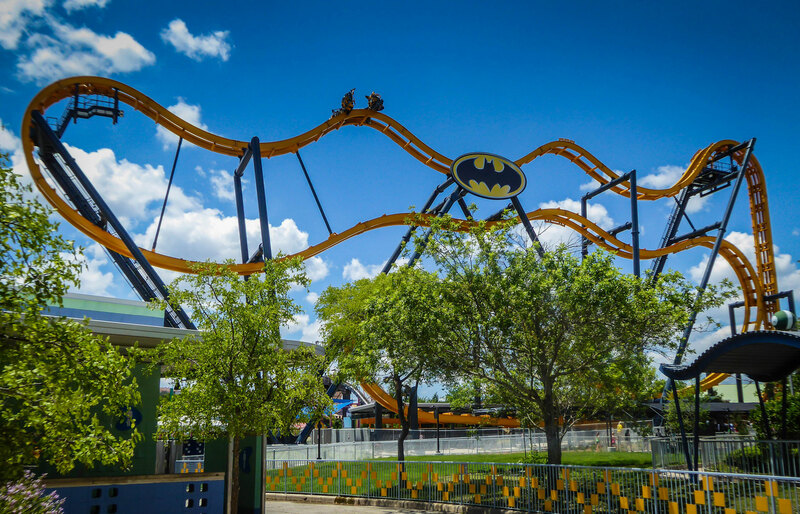 Batman The Ride at Six Flags Fiesta Texas in the USA. The S&S Free Spin coaster is the company’s version of a 4D Coaster and features wing seats like its Arrow and Intamin counterparts. 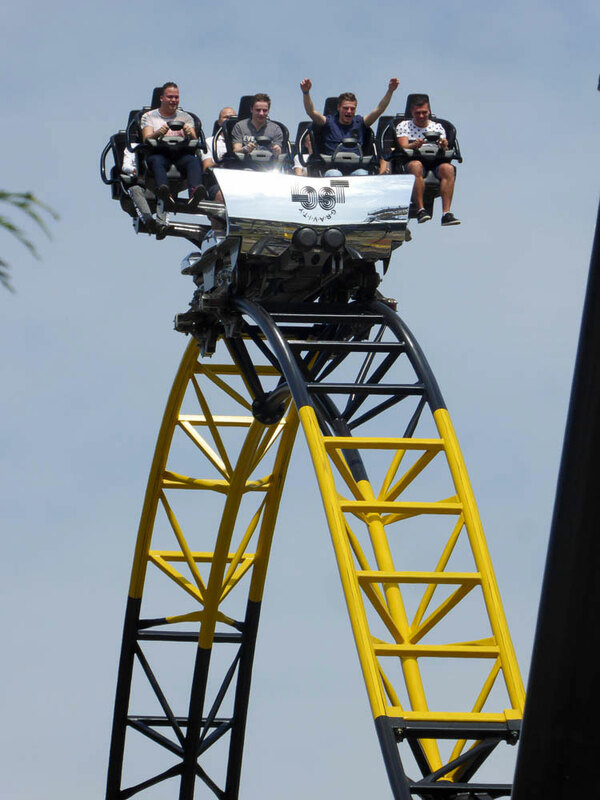 Like the ZacSpins’, the Free Spin seats rotate freely. 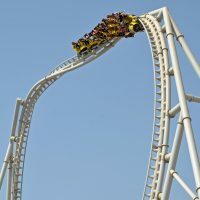 However, the seating is different with only two riders next to each other and the axis at the rider’s center of gravity rather than behind them. 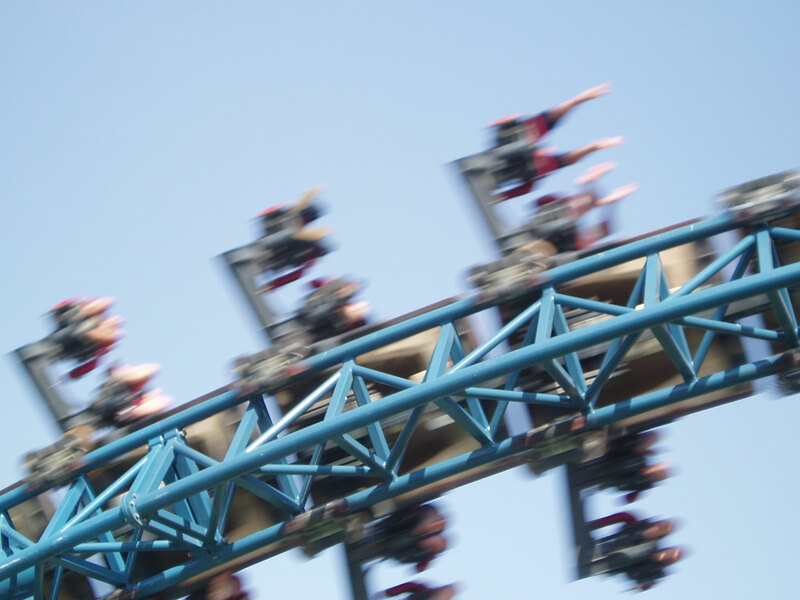 This allows for a more natural feeling rotation and a less painful ride experience. 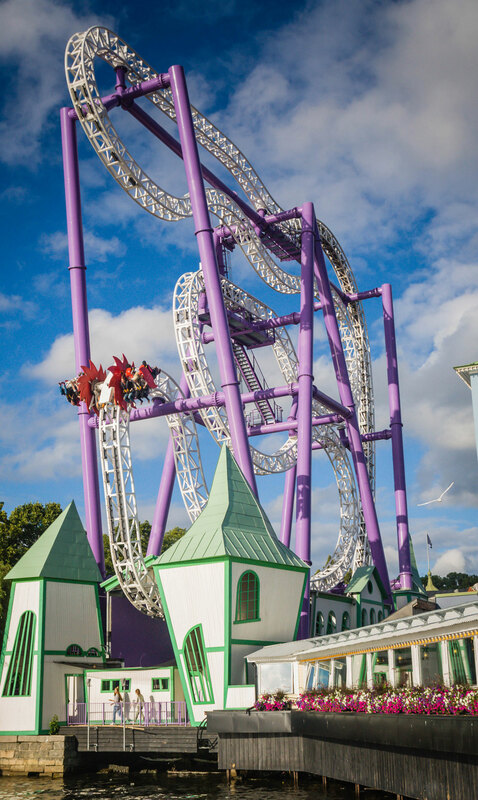 Tranan at Skara Sommarland in Sweden. 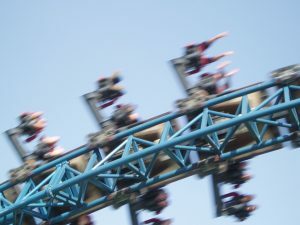 On the S&S Free Fly model, a row of bench seats is suspended below each wing and can freely rotate 360° as the coaster travels along the track. 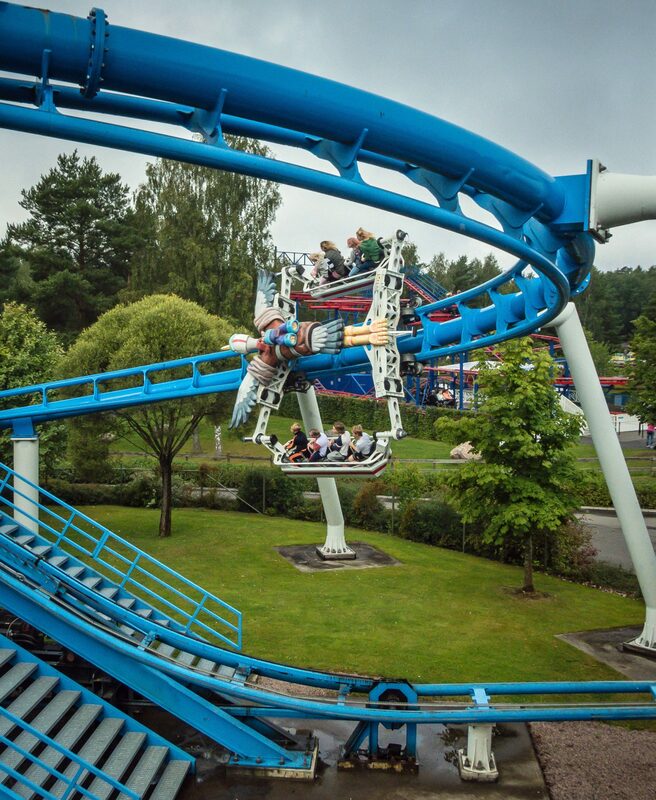 Tranan at Skara Sommarland in Sweden opened in 2009 and is the first and only S&S Free Fly. 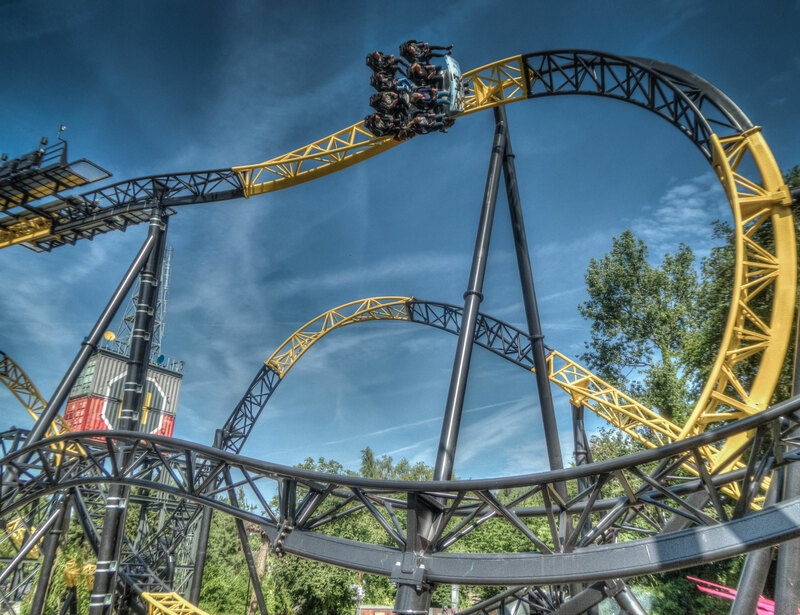 Lost Gravity at Walibi Holland in the Netherlands. 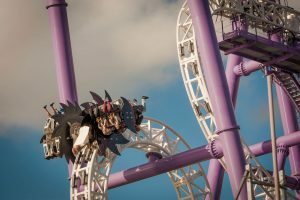 Mack Rides unveiled their first Wing Coaster in 2016 with the opening of Lost Gravity at Walibi Holland in the Netherlands. 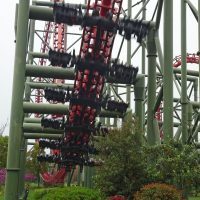 The “BigDipper” style cars on Lost Gravity have seats similar to those found on Intamin wing coasters with the two center seats above the track and the outer seats a little lower on either side. 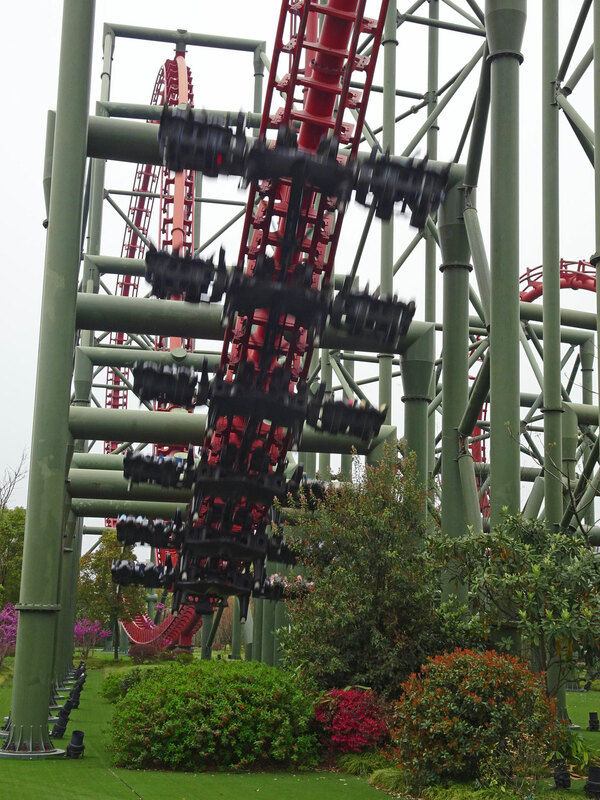 However, the cars have only two rows of seats, which allows the coaster to feature compact inversions.